Rafranz Davis’ TiE2015 keynote address “Inspiring Change Through Passion, Wonder and Voice” is now online! This keynote explores ways educators can support young people to use technology and take charge of their own learning. You’ll come away with inspiration and new ideas for learning inside and outside of the classroom. Many TiE2015 attendees came away from this presentation discussing access to and use of YouTube as necessary for students’ success. You can find more inspiring ideas from Rafranz on her blog – rafranzdavis.com – and on twitter @rafranzdavis. 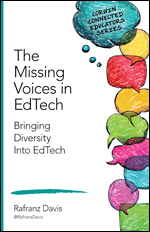 You can check out her brand new book The Missing Voices in EdTech: Bringing Diversity Into EdTech.